Mesh unfolding technique transforms an input 3D mesh into a single connected patch, which significantly facilitates us to construct the corresponding papercraft model. 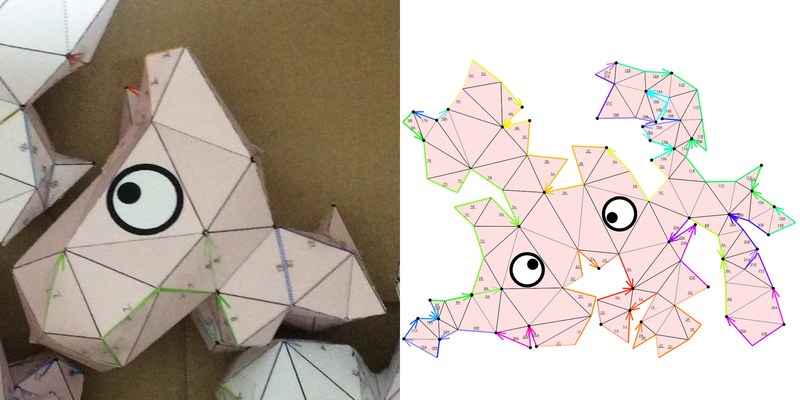 The mathematical concept of topological surgery guarantees that we can always find at least one such pair of duplicated seams that are next to each other on the boundary of the unfolded patch, thus we can construct the papercraft model just by stitching them one by one until all the seams are closed. This project aims to find the best position and minimal number of glue tags for 3D mesh unfolding problem. Last update by Hsiang-Yun Wu on 3. Mar 2018. Comments to yun (at) cg.tuwien.ac.at.